I read very little non-fiction other than cookbooks. I had heard so many good things about this book before I started it, and I have to say that every good thing was deserved. It has been a fascinating read so far. Men subjected to dehumanizing treatment experience profound wretchedness and loneliness and find that hope is almost impossible to retain. Without dignity, identity is erased. In its absence, men are defined not by themselves, but by their captors and the cirmcumstances in which they are forced to live. Great teaser. I've seen nothing but great things about this book. This week my teaser is from The Iron Knight. I wonder when I’ll get back into reading some non-fiction. I think the last was either Mao’s Last Dancer or Tokyo Vice. Great teaser! I find myself needing to read only fictional books. Don't know when the last time I even opened a non-fiction book that wasn't a textbook for school! It is a great teaser, but sounds very sad also. Thanks for the visit to my TT. How sad, but this book does sound interesting. If you get a chance, my teaser is here. WOW! That's one heck of a teaser. I'll admit that I have not heard of this book - but then again I've been very focused in my reading... Looks like I need to broaden a bit. Sounds like a fascinating read! Thanks for stopping by this morning. Very interesting teaser. I had not heard of this book. Will be interested in reading your review of it. My husband read and liked this one. There are lots of very interesting non-fiction books. Glad to see you are expanding your interests! Really makes you stop and think. I love this book, haven't reviewed it yet because it is so hard to write a review for it. I don't think I will give it justice. My favorite book this year so far. I don't read a whole lot of non-fiction either, it's difficult for me to focus on it sometimes. Great teaser though! My teaser is from Prophecy, which I'm also holding a giveaway for. I have this book, and am eager to read it. It sounds like it's a stunning story, and I look forward to reading your thoughts on it when you are finished with it. Great teaser today! 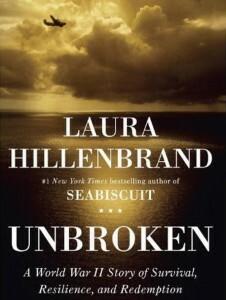 Read and thought so highly of Unbroken that I read Seabiscuit too. New blog for non-fiction "devotees" may be useful. Heckuva subject - and your teaser illustrates that. But this book has gotten such stellar reviews, too! Are you in the majority? Is it amazingly good? This is a fantastic teaser. Now I understand whu Laura Hillenbrand gets such rave reviews for her writing. I'm glad to knoiw you're enjoying this book! You know, I really need to read more non-fiction. Great teaser! I hadn't heard about this book until now. Maybe I'll check it out. Great teaser! Though the book sounds kind of sad. What do you think of it so far? Oh, that's a great teaser! I usually never even look twice at the non-fictions, but I have to take a look at this. I'm intrigued! My teaser can be found here! It's a tease for me as well, since it's a book I cannot wait to start! I am curious! The line-up at the library is long, though, so it might be a while.